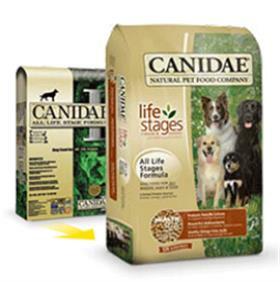 Canidae All Life Stages formula meets the AAFCO Dog Nutrient Profiles for all life stages. Canidae is by far the best food for my Great Dane and his sensitive stomach. I've tried several other high cost all natural foods and he would enjoy them, but every other week or so would get the "runs". I would have to get up in the middle of the night to take him out or constantly worry about a mess when I got home. With the A.L.S.F, I don't worry any more and my Dane has perfectly tapered poops everytime, no yeast infections in his ears and his coat is shiny and full. I have a 9-month-old German Shepherd who has been fed nothing but this food since he was weaned. He absolutely THRIVES on this food--bright eyes, glossy coat, tons of energy. He loves the food--I don't have put additives in to made it more palatable. People are always asking me what I feed him. A friend of mine has a dog who had skin and eye problems--I told her about this food and since she started him on this food, his problems are greatly diminished. My dogs were having problems with their food, they weren't eating so my vet recommended canidae, I switched to canidae and my dogs are eating normal and they have more energy.